I found the idea for this shirt in a issue of Australian Stitches magazine. This style has three darts radiating out from the right sideseam. 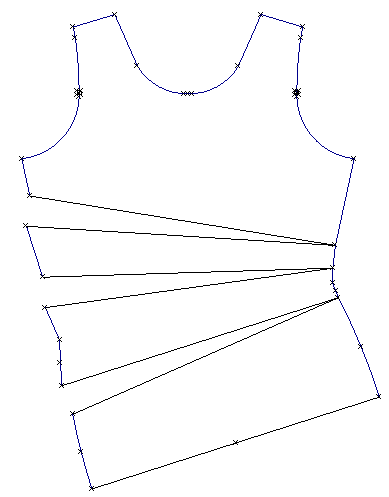 This project can be completed in any PatternMaster program. The fabric shown is a lightweight stable polyester knit. 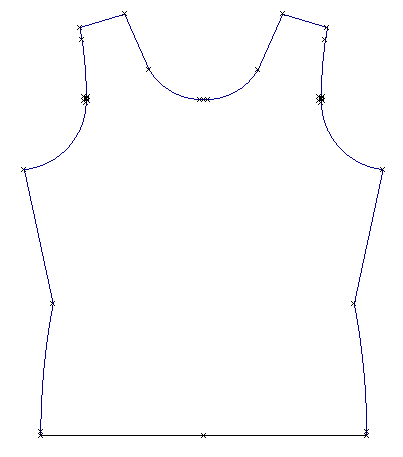 This style can be created with an armscye dart and most any neckline. The darts can also be stitched on the outside of the fabric for a different look. 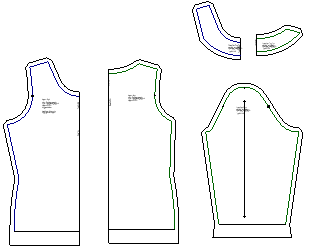 I have adapted the pattern making instructions for our PatternMaster Pattern Editor or Cameo Pattern Design. 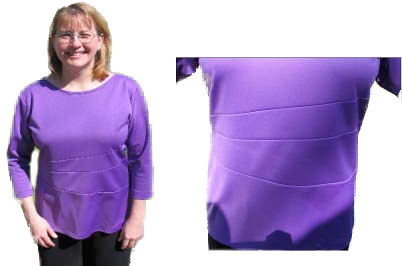 To make this style, launch PatternMaster and go to the Blouses, Tops, Shirts, or Activewear screen depending upon the program you are using. Make the following style options and settings. Save the style as Triple Darted Tee Shirt. Your patterns should look something like the patterns in Figure 1. 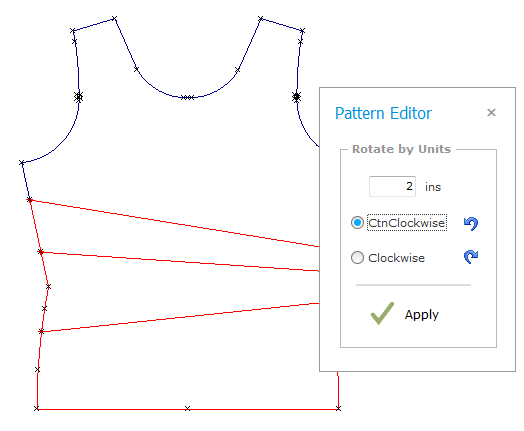 Open the patterns in the Pattern Editor. 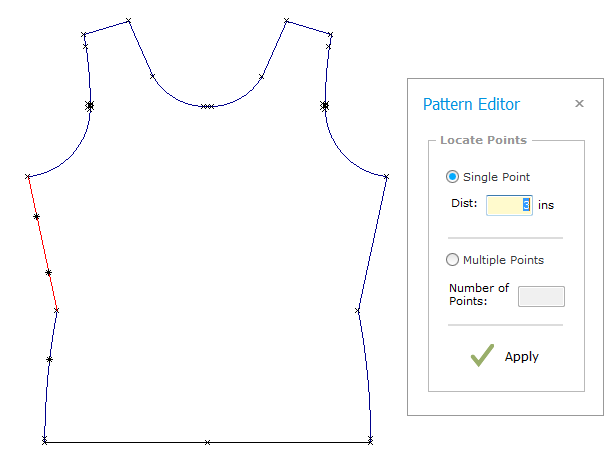 Select and delete all of the patterns except the front. Choose Save As from the File menu and enter Triple Darted Tee Shirt Front for the file name and save it. Select the Front and choose Ungroup (Ctrl U). 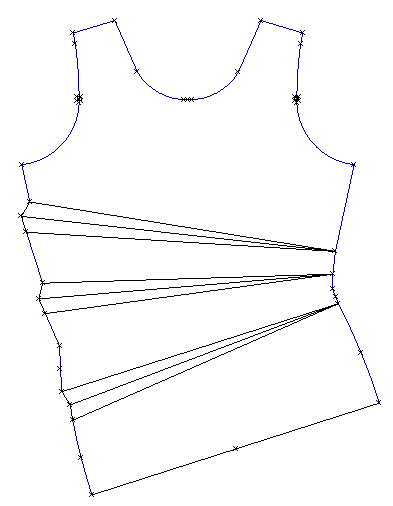 Select and delete the seam allowances (Fig. 2). 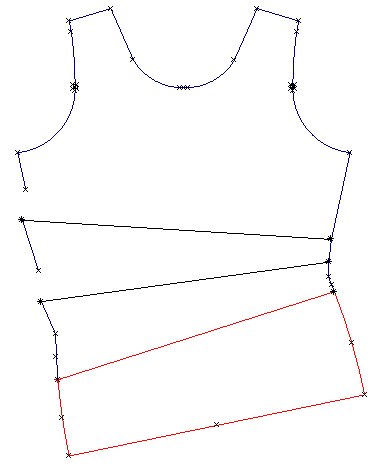 Select the front pattern and mirror (MI) on the center front line (Fig 3). Press the Save (FS) button. Locate the following points using the Locate Points (LP) tool (Fig. 4). Connect the points placed with lines as shown Figure 5. 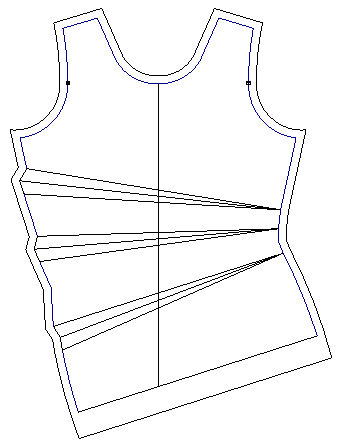 Use the Scissors tool to break the sideseam exactly at each point placed. Select the objects as shown in Figure 6 and choose the Rotate by Units tool. Snap to the top point placed on the right sideseam. Snap to the top point placed on the left sideseam. Enter 2 for the distance, choose counter clockwise and press the Apply button (Fig. 7). Select the objects as shown in Figure 8 and choose the Rotate by Units tool. Snap to the middle point placed on the right sideseam. Snap to the middle point placed on the left sideseam. Enter 2 for the distance, choose counter clockwise and press the Apply button. Select the objects as shown in Figure 9 and choose the Rotate by Units tool. Snap to the bottom point placed on the right sideseam. Snap to the bottom point placed on the left sideseam. Enter 2 for the distance, choose counter clockwise and press the Apply button. 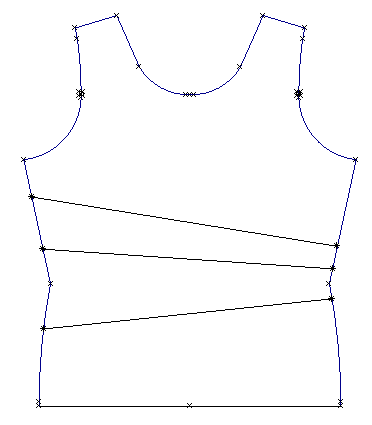 Draw lines to connect the new openings on the left sideseam with points on the right sideseam (Fig. 10). Choose the True Dart tool to true each opening (Fig. 11). 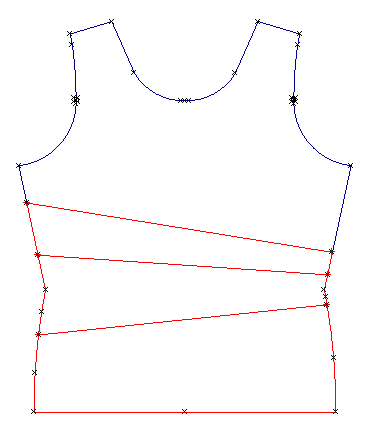 Use the Offset and Intersect tools to add seam allowances (Fig. 12). 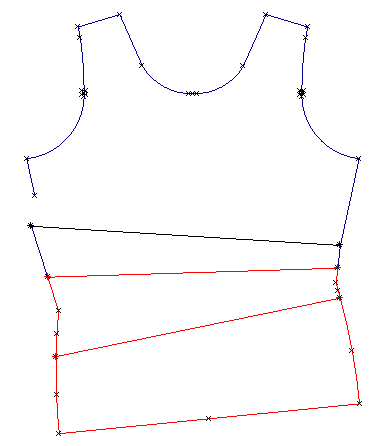 Draw an exactly horizontal line down the center of the pattern for a grainline (Fig. 12). Merge the original patterns and select and delete the original front pattern, group each pattern, if needed, and print.